Elfyn Evans has moved up from 13th to 2nd after a magnificent morning on Wales Rally GB. 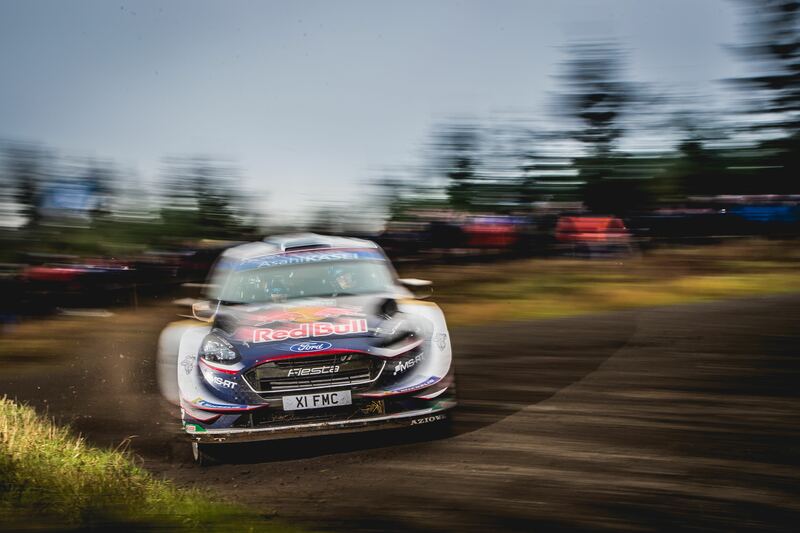 Elfyn Evans has made a magnificent start to today’s Dayinsure Wales Rally GB eight stages, and after the morning loop of five tests is second overall – just 8.9 seconds behind rally leader Ott Tänak. Co-driven by Dan Barritt, Evans started today in 13th place, after last night’s short opening stage at Tir Prince. The Dolgellau driver leapfrogged eight places to fifth after a great time through this morning’s slippery opening forest stage in Clocaenog and was then up to second after a superb time through Brenig, which is the longest stage of the event. And his time could have been even quicker, had a false puncture alarm not distracted him in his M-Sport Ford Fiesta WRC. Another great run through Penmachno forest, plus two fast and consistent runs through a very tricky Slate Mountain stage, sees Evans enter midday service in Deeside in a very strong second place. Tänak took the lead by setting fastest time in Clocaenog in his Yaris WRC, and was fastest in Brenig and Penmachno too. Tänak’s Toyota team-mate, Jari-Matti Latvala, is third, 6.5 seconds behind Evans. World Championship leader Thierry Neuville (Hyundai) is down in fifth, albeit just 0.3 seconds behind Teemu Suninen (Ford), after finding running first on the slippery gravel roads a big disadvantage. Title rival Sébastien Ogier (Ford) was lying third until he hit gearbox problems in Penmachno. With no first and second gears, the Frenchman spun twice and lost 16.5 seconds in the stage, and a further 7.4 seconds in the two short Slate Mountain stages. Ogier feels he needs to win Wales Rally GB to keep his title hopes alive, but he’s currently eighth, 27.9 seconds adrift of where he wants to be. The Clocaenog, Brenig and Penmachno stages will be repeated this afternoon.